You can’t read a draft guide, scout’s comment or analysis of UCLA quarterback Josh Rosen without seeing some negatives about his personality. While he’s praised for his “NFL ready” arm and style, he’s almost always knocked for his attitude, and the dreaded Jay Cutler personality comparisons. Greg doesn’t make this stuff up. He researches by talking to scouts, teams and college contacts. So there has to be some truth to all of this. But I always wonder if these narratives are really true, or have just become truth because they get repeated so often. As a reporter at heart, I want to find out for myself. To do that, I reached out to someone who knows Josh Rosen. UCLA radio color analyst Wayne Cook is a former Bruins quarterback himself. He is around Rosen, has seen him play every game, and has relationships with the coaches and team leaders. “Most people misunderstand him. The fact that he’s smart and questions people is coming up as a red flag. That’s funny to me,” said Cook. Cook has always been taught that it’s part of a quarterback’s job to challenge coaches, ask questions and be in charge. He doesn’t hold that against Rosen. When Rosen is cited for being too “selfish” in his style and how he plays, Cook has an explanation. Is Rosen A Good Guy? The bottom line question to Wayne is…what kind of guy is Josh? Self-confidence is another knock on Rosen. Cook doesn’t buy it. Wayne acknowledges that there is some injury history for Rosen. But he’s seen that happen because Josh wants to make a play, and is willing to stand in and take a hit. Wayne knows Josh will have to learn to throw the ball away and avoid hits. But he does not question Rosen’s toughness. Cook called Rosen’s passes some of the best he’s ever seen, with rarely a wobble. He thinks that will solve any issue playing in cold weather. 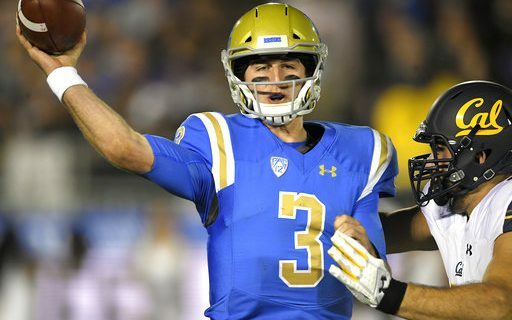 Is Rosen’s Personality a Factor? Is Cook right about Rosen? Are the scouts right? The answer is that both are right. Talent usually wins out in the NFL. Especially at quarterback. Beyond that, everything else plays a role. Including personality. If you think its a reason that the Bills should or shouldn’t draft him, hopefully you’ll take this information to heart and not believe the narrative. Paul writes about another narrative, that says the Bills need to draft Josh Allen to deal with the Buffalo weather.